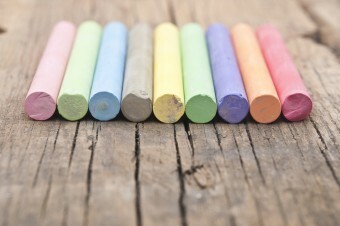 Ubiquitous in many classrooms since the 19th century, chalk and chalkboards are familiar to most of us. White, powdery and prone to sticking to those surfaces where it is put (and just as easy to wipe away), chalk and its accompanying board are excellent instructional aids. Notably, however, most chalk today isn’t technically chalk at all, but gypsum. 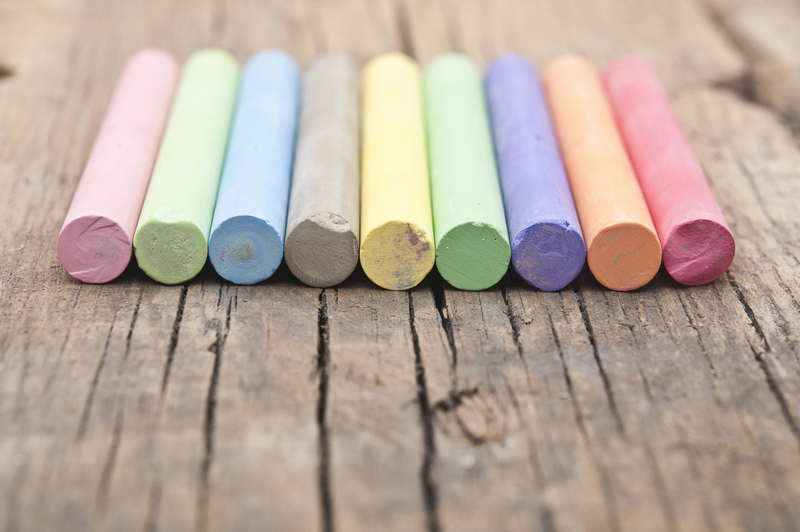 Chalk and gypsum have both been mined since ancient times. Chalk (calcium carbonate) has been found in cave paintings that date back to 40,000 BC, while gypsum (calcium sulfate) has been used as a mortar for construction since the dawn of civilization, and is even found in the Egyptian pyramids. Similar and yet distinct, chalk is a base (an alkali that neutralizes acids) that is composed of calcium and oxygen combined with carbon (CaCO3), while gypsum is a salt (the product of a base and acid reacting and both becoming neutralized), made up of calcium and oxygen combined with sulfur. Both are believed to be formed in similar fashion. Chalk is a limestone deposit created as plankton (tiny marine organisms) concentrate calcium in their bodies while living, then leach the calcium out after they die and settle onto ocean floors; over millennia, large deposits are formed, and as the seas recede, chalks deposits remain. Gypsum’s origins are similar, but in addition to being comprised of the calcium produced by the deaths of millions of plankton, gypsum also contains some of the salt that was left behind as the ocean evaporated. Traditionally chalk has been used for drawing and writing, and by the end of the 18th century, with advances in slate quarrying (slate was originally used for writing tablets and blackboards), writing slates covered with chalk letters, symbols, numbers and figures were commonplace. Gypsum on the other hand, had been used primarily in construction, such as for the aforementioned mortar, as well as in the manufacture of windows. Nonetheless, both are susceptible to a process that produces sticks of themselves that, when pressed against certain services, leave washable marks. After quarrying, each is crushed, ground, washed and sifted. With gypsum, it must also be dehydrated in a process that involves high temperatures to reduce its water content from nearly 21% to about 5-6%; to make classroom chalk, the material is mixed, again, with water (and colored pigments, if desired), and to produce more exotic pastels, such as used for art drawings, pigments as well as clays or oils are also added. For the former, the chalk is baked, while with the latter, it is air-dried. It’s not clear why gypsum has replaced chalk for writing on blackboards (which today are mostly green, but that’s another story). While historically chalk has been remarkably dusty, modern manufacturing methods, including baking the chalk and coating it with products like shellac, have reduced the problem for both materials. The most likely reason is that gypsum is abundant, easily mined and processed in enormous quantities. The mineral is mined in more than 90 countries, including Canada, Mexico, Spain and the United States. In the U.S., 19 states (notably California, Iowa, Nevada, Oklahoma and Texas) have surface-mining operations, and the U.S. alone produces more than 30 million tons of the stuff each year. Since it can be reconstituted, it can be fashioned into any of a myriad of shapes and modified for various uses. Common applications include plaster of Paris, creating clay molds from which a variety of plastic products are formed (such as plastic cups and plates), the manufacture of glass, as an ingredient in cement and in drywall (this last has been a boon to humanity as gypsum is naturally fire resistant). Non-toxic, gypsum also pops up in fertilizers and soil conditioners, hair products, to make plasters of teeth, to grow mushrooms, brew beer and bind tofu (which also has the added benefit of making bean curd an excellent calcium source). In 2013, North American gypsum manufacturers reported sales of gypsum board, alone, of more than $3 billion, annually; together they produced more than 20.5 billion square feet of drywall, which is found in more than 97% of American buildings. “Today I found out” is a beautiful web site, to begin with. I love it! But I am a little bit shocked, this time. Either I have learned the wrong facts, or I remember completely wrong, or you are just talking nonsense. Well, completely nonsense is it not, but part of the facts are not the way I know them. And it is definitely not true that the plankton (that is: only those that store CaCO3 in their body) “leach” the calcium out. Calcium is a very reactive metal, that cannot be set free in this way. They die, and their chalk skeletons is what remains on the sea-floor. As a sediment it is compressed and can even change into marmor. And gypsum as a mixture of calcium and “some of the salt”? No way! As said before: calcium does not occur free. Gypsum is just CaSO4, it is the salt as a whole. By the way, I did not know that gypsum also comes from plankton, where did you find that information? As far as I know it comes from CaCO3 deposits, that react with acidic water, e.g. sulphuric acid rain from volcanos. So, maybe you can indicate what your sources are. I would love to read them, especially since your information contradicts everything that I have learned as a chemist.